Over at Math3ma, Tai-Danae Bradley shared the following puzzle, which she also featured in a fantastic (spoiler-free) YouTube video. If you’re seeing this for the first time, watch the video first. Consider a square in the xy-plane, and let A (an “assassin”) and T (a “target”) be two arbitrary-but-fixed points within the square. Suppose that the square behaves like a billiard table, so that any ray (a.k.a “shot”) from the assassin will bounce off the sides of the square, with the angle of incidence equaling the angle of reflection. Puzzle: Is it possible to block any possible shot from A to T by placing a finite number of points in the square? This puzzle found its way to me through Tai-Danae’s video, via category theorist Emily Riehl, via a talk by the recently deceased Fields Medalist Maryam Mirzakhani, who studied the problem in more generality. I’m not familiar with her work, but knowing mathematicians it’s probably set in an arbitrary complex -manifold. See Tai-Danae’s post for a proof, which left such an impression on me I had to dig deeper. In this post I’ll discuss a visualization I made—now posted at the end of Tai-Danae’s article—as well as here and below (to avoid spoilers). In the visualization, mouse movement chooses the firing direction for the assassin, and the target is in green. Dragging the target with the mouse updates the position of the guards. The source code is on Github. The visualization uses d3 library, which was made for visualizations that dynamically update with data. I use it because it can draw SVGs real nice. The meat of the visualization is in two geometric functions. Decompose a ray into a series of line segments—its path as it bounces off the walls—stopping if it intersects any of the points in the plane. Compute the optimal position of the guards, given the boundary square and the positions of the assassin and target. As with most programming and software problems, the key to implementing these functions while maintaining your sanity is breaking it down into manageable pieces. Incrementalism is your friend. We start at the bottom with a Vector class with helpful methods for adding, scaling, and computing norms and inner products. This allows one to compute the distance between two points, e.g., with vector.subtract(otherVector).norm(). Next we define a class for a ray, which is represented by its center (a vector) and a direction (a vector). The ray must be finite for us to draw it, but the length we've chosen is so large that, as you can see in the visualization, it's effectively infinite. Feel free to scale it up even longer. The interesting bit is the intersection function. 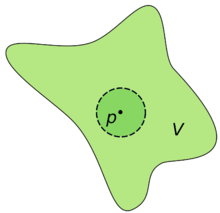 We want to compute whether a ray intersects a point. To do this, we use the inner product as a decision rule to compute the distance of a point from a line. If that distance is very small, we say they intersect. In our demo points are not infinitesimal, but rather have a small radius described by intersectionRadius. For the sake of being able to see anything we set this to 3 pixels. If it’s too small the demo will look bad. The ray won’t stop when it should appear to stop, and it can appear to hit the target when it doesn’t. rayIntersection: Compute the intersection point of a ray with the rectangle. isOnVerticalWall: Determine if a point is on a vertical or horizontal wall of the rectangle, raising an error if neither. splitRay: Split a ray into a line segment and a shorter ray that’s “bounced” off the wall of the rectangle. Next, splitRay splits a ray into a single line segment and the “remaining” ray, by computing the ray’s intersection with the rectangle, and having the “remaining” ray mirror the direction of approach with a new center that lies on the wall of the rectangle. The new ray length is appropriately shorter. If we run out of ray length, we simply return a segment with a null ray. As you have probably guessed, rayToPoints simply calls splitRay over and over again until the ray hits an input “stopping point”—a guard, the target, or the assassin—or else our finite ray length has been exhausted. The output is a list of points, starting from the original ray’s center, for which adjacent pairs are interpreted as line segments to draw. That’s sufficient to draw the shot emanating from the assassin. This method is called every time the mouse moves. The function to compute the optimal position of the guards takes as input the containing rectangle, the assassin, and the target, and produces as output a list of 16 points. Compute mirrors of the target across the top, the right, and the top+right of the rectangle. Call this resulting thing the 4-mirrored-targets. Replicate the 4-mirrored-targets four times, by translating three of the copies left by the entire width of the 4-mirrored-targets shape, down by the entire height, and both left-and-down. Now you have 16 copies of the target, and one assassin. This gives 16 line segments from assassin-to-target-copy. Place a guard at the midpoint of each of these line segments. Finally, apply the reverse translation and reverse mirroring to return the guards to the original square. Due to WordPress being a crappy blogging platform I need to migrate off of, the code snippets below have been magically disappearing. I’ve included links to github lines as well. Step 4, returning the guards back to the original square, is harder than it seems, because the midpoint of an assassin-to-target-copy segment might not be in the same copy of the square as the target-copy being fired at. This means you have to detect which square copy the midpoint lands in, and use that to determine which operations are required to invert. This results in the final block of this massive function. // different copies of the square, we have to check each one for all cases. // undo the translations to get the midpoints back to the original 4-mirrored square. There are a few improvements I’d like to make to this puzzle, but haven’t made the time (I’m writing a book, after all!). Be able to drag the guards around. Create new guards from an empty set of guards, with a button to “reveal” the solution. Include a toggle that, when pressed, darkens the entire region of the square that can be hit by the assassin. For example, this would allow you to see if the target is in the only possible safe spot, or if there are multiple safe spots for a given configuration. Perhaps darken the vulnerable spots by the number of possible paths that hit it, up to some limit. The most complicated one: generalize to an arbitrary polygon (convex or not! ), for which there may be no optional solution. The visualization would allow you to look for a solution using 2-4. Pull requests are welcome if you attempt any of these improvements. Guest Post: Torus-Knotted Baklava at Baking And Math, a blog by my friend and colleague, Yen. The reader might wonder how we can say anything about space if we can’t compute distances between things. Indeed, how could it even really be “space” as we know it? The short answer is: the reader shouldn’t think of a topological space as a space in the classical sense. While we will draw pictures and say some very geometric things about topological spaces, the words we use are only inspired by their classical analogues. In fact the general topological space will be a much wilder beast, with properties ranging from absolute complacency to rampant hooliganism. Even so, topological spaces can spring out of every mathematical cranny. They bring at least a loose structure to all sorts of problems, and so studying them is of vast importance. Just before we continue, we should give a short list of how topological spaces are applied to the real world. In particular, this author is preparing a series of posts dedicated to the topological study of data. That is, we want to study the loose structure of data potentially embedded in a very high-dimensional metric space. But in studying it from a topological perspective, we aim to eliminate the dependence on specific metrics and parameters (which can be awfully constricting, and even impertinent to the overall structure of the data). In addition, topology has been used to study graphics, image analysis and 3D modelling, networks, semantics, protein folding, solving systems of polynomial equations, and loads of topics in physics. Now we turn to generalizing metric spaces. The key property which we wish to generalize is that of open sets. For a metric space, and the reader should be thinking of the real line, the Euclidean plane, or three-dimensional Euclidean space, the open sets are easy to find. One can think of them as just “things without a boundary.” On the real line these look like open intervals and unions of open intervals. In the plane, these would be more like open balls with a fixed center. In other words, it would be the interior of a disk. Specifically, the number 1 is in the intersection since it is contained in all of the open intervals. But any number cannot be in the intersection because for some large enough it must be that (just solve this equation for as a real number, and then take the ceiling). The case is similar case for , so the intersection can only be the singleton set 1. This is clearly not an open interval. A finite intersection of such open balls. A set is closed if it is the complement of an open set. In fact, this characterization of open sets is so good that we can redefine a bunch of properties of metric spaces just in terms of open sets. This is important because in a minute we will actually define a topological space by declaring which sets are open. Before we do that, let’s remain in the friendly world of metric spaces to investigate some of those redefinitions. There is an essential switch in going from metric spaces to topological spaces that one must take, and it involves the concepts of neighborhoods. Definition: Let be a point in a metric space . A neighborhood of is any open set containing . More specifically, we can distinguish between an open neighborhood and a closed neighborhood, but without qualifiers we will always mean an open neighborhood. In particular, the concept of a neighborhood will completely replace the idea of a metric. We will say things like, “for any neighborhood…” and “there exists a neighborhood…”, which will translate in the case of metric spaces to, “for any sufficiently close point…” and “there exists a sufficiently close point…” The main point for this discussion, however, is that if open sets were defined in some other way, the definition would still apply. Definition: Let be a metric space with metric , and let be a sequence of elements in . We say converges to if for any , there is some sufficiently large so that the distance whenever . In other words, after the -th point in the sequence, the values will always stay within a tiny distance of , and we can pick that tiny distance (\varepsilon) arbitrarily close to . So the sequence must converge to . Definition: Let be as in the previous definition. We say that converges to if for any open neighborhood of , there is some sufficiently large so that for all . In particular, these two definitions are equivalent. Before we give the proof, the reader should be warned that pictures will make this proof obvious (but not rigorous), so we encourage the reader to follow along with a piece of paper. Open balls are drawn as circles despite the dimension of the space, and open neighborhoods are usually just drawn as “blobs” containing a certain point. To see the definitions are equivalent, suppose converges as in the second definition. Then given an , we can choose a particular choice of open neighborhood to satisfy the constraints of the first definition: just choose the open ball . This will translate in terms of the metric precisely to the first definition. Conversely if the first definition holds, all we need to show is that for any open neighborhood of any point , we can always find an open ball contained entirely in . We can apply this to pick that open ball around , and use the first definition to show that all of the will be inside that open ball (and hence inside ) forever onward. Specifically pick the radius so that , any point inside the ball centered at is also in the ball centered at , and we can see this by simply drawing the triangle connecting these three points, and applying the triangle inequality to show that . A similar idea works if is a finite intersection of open balls , where we just take the smallest ball around of those we get by applying the above picture to each . The other main definition we want to convert to the language of open sets is that of a continuous function. In particular, when we study metric spaces in pure mathematics, we are interested in the behavior of continuous functions between them (more so, even, than the properties of the spaces themselves). Indeed, when we study calculus in high school and university, this is all we care about: we want to look at minima and maxima of continuous functions, we want to study derivatives (the instantaneous rate of change) of a continuous function, and we want to prove theorems that hold for all continuous functions (such as the mean value theorem). Definition: A function of metric spaces with metrics is called continuous if for all there is a such that whenever the distance . In words, whenever are close in , it follows that are close in . Naturally, the corresponding definition in terms of open sets would be something along the lines of “for any open neighborhood of in , there is an open neighborhood of in which contains .” In fact, this is an equivalent definition (which the reader may verify), but there is a much simpler version that works better. Definition: A function is called continuous if the preimage of an open set under is again an open set. That is, whenever is open, then is open in . The reason this is a better definition will become apparent later (in short: a general topology need not have “good” neighborhoods of a given point ). But at least we can verify these three definitions all coincide for metric spaces. These dry computations are very similar to the one we gave for convergent sequences, so we leave it to those readers with a taste for blood. We will just simply mention that, for example, all polynomial functions are continuous with respect to this definition. We are now ready to define a general topological space. The empty set and the subset are both in . Any union of sets in is again in . Any finite intersection of sets in is again in . We call the pair a topological space, and we call any set in and open set of . Definition: A set in a topological space is closed if its complement is open. As we have already seen, any metric space is a topological space, where the topology is the set of all open balls centered at all points of . We say the topology on is induced by the metric . When is either or , we call the topology induced by the Euclidean metric the Euclidean topology on . But these topological spaces are very well-behaved. We will work extensively with them in our applications, but there are a few classical examples that every student of the subject must know. If we have any set , we may define a very silly topology on by defining every subset of to be open. This family of subsets trivially satisfies the requirements of a topology, and it is called the discrete topology. Perhaps the only interesting question we can ask about this topology is whether it is induced by some metric on the underlying space. The avid reader of this blog should be able to answer this question quite easily. The natural second example after the discrete topology is called the indiscrete topology. Here we simply define the topology as . Again we see that this is a well-defined topology, and it’s duller than a conversation with the empty set. As a third and slightly less trivial example, we point the reader to our proof gallery, where we define a topology on the integers and use it to prove that there are infinitely many primes. Note that we can also define a topology on by specifying a family of closed sets, as long as any intersection of closed sets is closed, and a finite union of closed sets is closed. This is because of the way unions, intersections, and complements interact. and vice versa for intersections; proving this is a simple exercise in set theory. Here is an extended (and vastly more interesting) example. Let , and define a set to be closed if it is the set of common roots of a collection of polynomials in variables (which in our example below will be and , but in general are often written ). The set of roots is also called the zero locus of the collection of polynomials. This topology is called the Zariski topology on , and it is an extremely important topology in the field of algebraic geometry. A nodal cubic curve (source Wikipedia). The red curve is thus a closed set in the Zariski topology, and its complement is an open set. If we add in another polynomial (with a few exceptions) it is not hard to see that their common set of zeroes will either be the empty set or a finite set of points. Indeed, in the Zariski topology every finite set of points is closed. The intrepid reader can try to show that any finite set can be defined using exactly two polynomials (hint: you’ll get a better idea of how to do this in a moment, and without loss of generality, you can ensure one of the two is an interpolating polynomial). 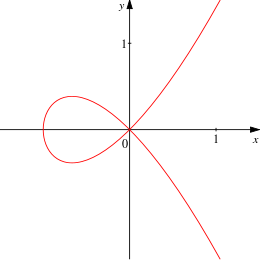 Verifying that the Zariski topology is indeed a topology, it is clear that the empty set and the entire set are closed: the constant polynomial has no roots, and the zero polynomial has all points as its roots. Now, the intersection of any two closed sets is just the union of two collections . By adding more constraints, we only keep the points with are solutions to both the and the (despite the union symbol, this truly corresponds to an intersection). Moreover, it is clear that we can take arbitrary unions of families of polynomials and still get a single family of polynomials, which still defines a closed set. On the other hand, given two closed sets defined by the families of polynomials , we can achieve their union by looking at the closed set defined by the set of polynomial products for all possible pairs . To show this defines the union, take any point which is in the union of the two closed sets. In other words, is simultaneously a zero of all or all . Since every polynomial in this new collection has either an factor or a factor, it follows that is simultaneously a root of all of them. Conversely, let is a simultaneous root of all of the . If it weren’t a common zero of all the and it weren’t a common zero of all the , then there would be some for which is not a root of and similarly some for which is not a root of . But then could not be a root of , contradicting that is in the closed set to begin with. Thus we have verified that this actually defines the union of two closed sets. By induction, this gives us finite unions of closed sets being closed. So the Zariski topology is in fact a valid topology on , and it is not hard to see that if is any field, then there is a well-defined Zariski topology on the set . In fact, studying this topology very closely yields a numerous amount of computational tools to solve problems like robot motion planning and automated theorem proving. 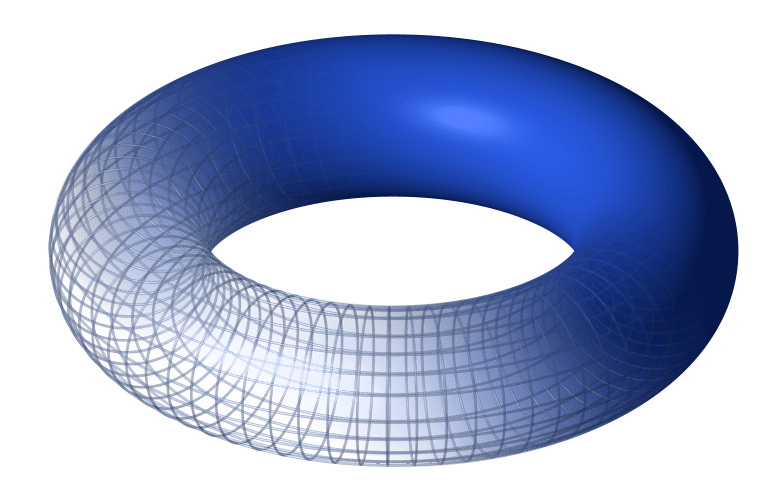 We plan to investigate these topics in the future of this blog once we cover a little bit of ring theory, but for now the Zariski topology serves as a wonderful example of a useful topology. One major aspect of mathematics is how to find the correct notion of calling two things “equivalent.” In the theory of metric spaces, the strongest possible such notion is called an isometry. That is, two metric spaces with metrics are called isometric if there exists a surjective function which preserves distance (i.e. for all , and the image is all of ). It is not hard to see that such functions are automatically both continuous and injective. The function is called an isometry. Now we can call two metric spaces “the same” if they are isometric. And they really are the same for all intents and purposes: the isometry simply relabels the points of as points of , and maintains the appropriate distances. Indeed, isometry is such a strong notion of equivalence that isometries of Euclidean space are completely classified. However, because we don’t have distances in a topological space, the next best thing is a notion of equivalence based on continuity. This gives rise to the following definition. Definition: A function between topological spaces is a homeomorphism if it is continuous, invertible, and its inverse is also continuous. In this case we call and homeomorphic, and we write . Transform a circle into a square by projecting from the center of the circle (source: Quora). To see how this is done, take any point on the circle, and draw a ray from the center of the circle through . This line will intersect the square somewhere, and we can define to be that point of intersection. It is easy to see that a slight perturbation of the choice of will only slightly change the image , and that this mapping is invertible. This flavor of proof is standard in topology, because giving an argument in complete rigor (that is, defining an explicit homeomorphism) is extremely tedious and neither enlightening nor satisfying. And while there are a few holes in our explanation (for instance, what exactly is the topology of the square? ), the argument is morally correct and conveys to the reader one aspect of what a homeomorphism can do. On the other hand, in our first two examples of topological space, the discrete and indiscrete topologies, homeomorphisms are nonsensical. In fact, any two spaces with the discrete topology whose underlying sets have the same cardinality are homeomorphic, and the same goes for the indiscrete topology. This is simply because every function from a discrete space is continuous, and any function to an indiscrete space is continuous. In some sense, such topological spaces are considered pathological, because no topological tools can be used to glean any information about their structure. As expected, the composition of two homeomorphisms is again a homeomorphism. From this it follows that homeomorphism is an equivalence relation, and so we can try to classify all topological spaces (or some interesting family of topological spaces) up to homeomorphism. Of course, there are some very simple spaces that cannot be homeomorphic. For instance (again in the Euclidean topology), a circle is not homeomorphic to a line. While we will not prove this directly (that would require more tedious computations), there are good moral reasons why it is true. We will later identify a list of so-called topological invariants. These are properties of a topological space that are guaranteed to be preserved by homeomorphisms. In other words, if a space has one of these properties and another space does not, then and cannot be homeomorphic. A simple-minded topological invariant relevant to the question at hand is the existence of a “hole” in the space. 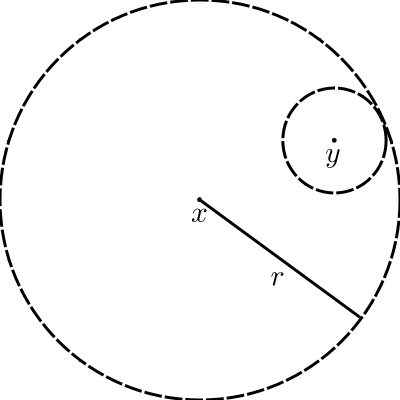 Since the circle has a hole but the line does not, they cannot be homeomorphic. We will spend quite a lot of time developing more advanced topological invariants, but in the next primer we will list a few elementary and useful ones. Of course there are many beautiful and fascinating topological spaces in higher dimensions. We will close this post with a description of a few of the most famous ones in dimension two (and, of course, we are ignoring what “dimension” rigorously means). An explicit homeomorphism between a torus and a coffee cup (source Wikipedia). This is a testament to the flexibility of homeomorphisms. The Klein bottle is a fascinating object, because it does not “live” in three dimensions. Despite that it appears to intersect itself in the picture above, this is just a visualization of the Klein Bottle. It actually lives in four-dimensional space (which is impossible to visualize) and in this setting the space does not intersect itself. We say that the Klein Bottle can be embedded into , but not , and we will make this notion rigorous in the next primer. While this is not at all obvious, the torus and the Klein bottle are not homeomorphic. The last space we will introduce is the real projective plane. This space, commonly denoted , also does not embed in three-dimensional Euclidean space. Unlike the Klein Bottle, has no reasonable visualization, so a picture would be futile. Instead, we can think of it as a particular modification of a sphere: take a hollow sphere and “glue together” any pair of antipodal points (that is, points which are on the same line through the center of the sphere). This operation of “gluing,” although it may seem awkward, does define a perfectly good topological space (we will cover the details in the next primer). Of course, it is extremely hard to get a good idea of what it looks like, except to say that it is “kind of” like a sphere with some awkward twists in it. 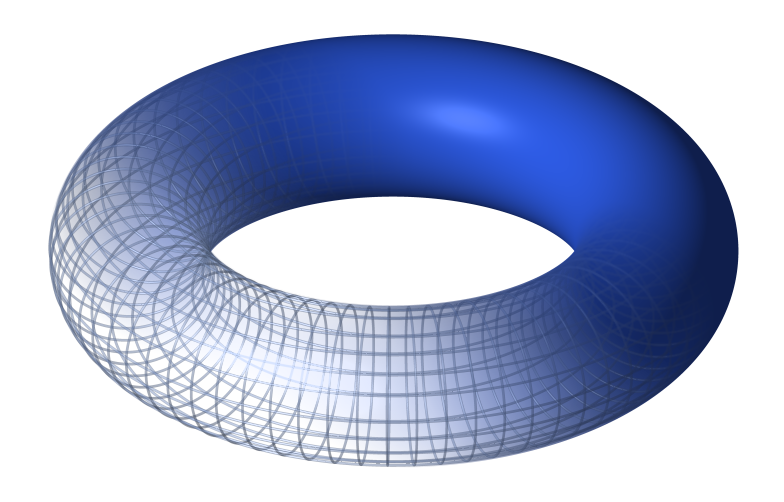 Again, is not homeomorphic to either of the torus or the Klein Bottle. This only scratches the surface of commonly seen topological spaces (the Möbius strip comes to mind, for instance). While we don’t have nearly enough space or time on this blog to detail very many of them, next time we will investigate ways to take simple topological spaces and put them together to make more complex spaces. We will rigorize the notion of “gluing” spaces together, along with other common operations. We will also spend some time developing topological invariants which allow us to “count” the number of “holes” in a space. These invariants will become the sole focus of our applications of topology to data analysis.